This paper presents the synthesis and characterization of monometallic and bimetallic cobalt and iron nanoparticles supported on alumina. The catalysts were prepared by a wet impregnation method. Samples were characterized using temperature-programmed reduction (TPR), temperature-programmed oxidation (TPO), CO-chemisorption, transmission electron microscopy (TEM), field emission scanning electron microscopy (FESEM-EDX) and N2-adsorption analysis. Fischer-Tropsch synthesis (FTS) was carried out in a fixed-bed microreactor at 543 K and 1 atm, with H2/CO = 2 v/v and space velocity, SV = 12L/g.h. The physicochemical properties and the FTS activity of the bimetallic catalysts were analyzed and compared with those of monometallic cobalt and iron catalysts at similar operating conditions. H2-TPR analysis of cobalt catalyst indicated three temperature regions at 506°C (low), 650°C (medium) and 731°C (high). The incorporation of iron up to 30% into cobalt catalysts increased the reduction, CO chemisorption and number of cobalt active sites of the catalyst while an opposite trend was observed for the iron-riched bimetallic catalysts. The CO conversion was 6.3% and 4.6%, over the monometallic cobalt and iron catalysts, respectively. Bimetallic catalysts enhanced the CO conversion. Amongst the catalysts studied, bimetallic catalyst with the composition of 70Co30Fe showed the highest CO conversion (8.1%) while exhibiting the same product selectivity as that of monometallic Co catalyst. Monometallic iron catalyst showed the lowest selectivity for C5+ hydrocarbons (1.6%). Fischer-Tropsch synthesis (FTS) is a process which deals with the conversion of syngas derived from coal, biomass and natural gas into hydrocarbons consisting of paraffins, olefins, alcohols and aldehydes with a high cetane number and is environmentally friendly . Due to limited petroleum reserves and environmental restrictions, Fischer-Tropsch synthesis (FTS) is gaining more attention nowadays than ever. FTS is considered as a surface-catalyzed polymerization reaction. During this process, CO is adsorbed on the surface of the transition metal and hydrogenated producing CHx monomers which consequently propagate to produce hydrocarbons and oxygenates with a broad range of functionalities and chain lengths . All the group VIII elements show considerable activity for this process. Among them Co, Fe and Ru present the highest activity . Due to high activity for Fischer-Tropsch synthesis, high selectivity to linear products, more stability towards deactivation, low activity towards water-gas shift (WGS) reaction and low cost compared to Ru, cobalt-based catalysts are the preferred catalyst for Fischer-Tropsch synthesis [4, 5]. In order to enhance the catalytic activity and stability, different combinations of these active metals have been reported such as Co-Fe , Co-Mn  and Fe-Mn . It has been reported that the addition of two active FTS metals gave additional properties which are quite different than the one expected for monometallic catalysts. The physical and chemical properties of Co/Fe systems have been discussed by Guerrero-Ruiz et al. . In many heterogeneous reactions, these active phases are dispersed on a support which not only acts as a carrier but may also contribute to the catalytic activity. Al2O3, SiO2 and TiO2 are the commonly used supports for cobalt-based catalysts [10, 11]. The incorporation of a second metal component into the catalyst may result in the geometric or electronic modifications of the catalyst which may result in the modification of adsorption characteristics of the catalysts' surface and in some cases alter the reduction and deactivation behavior. Bimetallic catalysts possess different physicochemical properties than that of the monometallic catalysts. Pena O'Shea et al. studied the activity of Co-Fe/SiO2 in a fixed-bed and slurry reactors. They reported that bimetallic catalysts were more active and stable than the monometallic catalysts in the fixed-bed reactor. An opposite behavior was observed for the slurry reactor. The performance of Co-Fe/TiO2  catalyst has also been reported. The performance of the bimetallic on alumina has not that much been reported in the literature. In this paper we wish to report our preliminary study on the synthesis of mono- and bimetallic catalysts of Co and Fe. The effects of incorporating Fe into Co on the physicochemical properties of the alumina-supported catalysts in terms of degree of reduction, CO and H2 chemisorptions, metal particle size, textural properties and their selectivities and activities in the FTS are presented. Figure 1 depicts the representative FESEM image of calcined Co/Al2O3 catalyst. The metal particles are indicated by arrows. FESEM analysis revealed that the metal particles were evenly distributed on the alumina support. Addition of iron in lower amounts (up to 30%) did not change the morphology of the catalysts. Figure 2 shows the TEM images of monometallic and bimetallic catalysts on Al2O3 support. The average size of metal-oxide particles was calculated from the TEM images. The average particle size of Co and Fe was found to be 13 nm and 10 nm, respectively. Incorporation of iron into Co resulted in an increase in the average metal particle size where for the 50Co50Fe on Al2O3, the average size of metal particles was found to be 18 nm. Representative FESEM image of the 5wt%Co/Al 2 O 3 catalyst. TEM images of the catalyst 5wt% metal on Al 2 O 3 . BET specific surface area, total pore volume and average pore diameter of the samples are listed in Table 1. All the samples exhibited type IV isotherm at high relative pressures (p/po), which is typical of mesoporous materials. There was a significant decrease in BET specific surface area and pore volume for alumina after metal impregnation. The specific surface area of alumina was found to be 190 m2/g while its pore volume was 0.1 cm3/g with a pore diameter of 9.8 nm. The surface area of Co/Al2O3 and Fe/Al2O3 was 180 m2/g and 165 m2/g, respectively. Pore volume and pore size of these catalyst samples were found to be less than those of the alumina. The decrease in BET specific surface area, total pore volume and pore diameter after the impregnation of metals on alumina indicated that metal nanoparticles were mainly incorporated inside the pores rather than on the external surface of alumina. This effect was even more pronounced for bimetallic catalysts as the Al2O3 surface area was reduced by 34%. H2-Temperature-programmed reduction (TPR) profiles of the catalysts are shown in Figure 3 and their peak positions are compiled in Table 2. For the Co/Al2O3 catalyst, the peak at 507°C was assigned to the first reduction step of Co3O4 to CoO while the peak at 650°C was from the second reduction step of CoO to Co°. The peak appearing at 731°C was attributed to the reduction of very small metal particles and mixed metal-support oxides [14, 15]. The reduction of iron oxides takes place in two steps. In the first step, Fe2O3 was reduced to Fe3O4 and the second step involved the reduction of Fe3O4 to FeO which was consequently reduced to Fe. Generally FeO is not expected to appear in the TPR spectra as it has been shown that FeO is unstable compared to Fe and Fe3O4. For the Fe/Al2O3, reduction of Fe2O3 to Fe3O4 took place at 454°C. The reduction of Fe3O4 to Fe occurred at 635°C while the peak appearing at 716°C was assigned to the reduction of small metal particles and mixed oxides which are difficult to reduce [16, 17]. H 2 -TPR profiles of the 5wt% catalysts supported on Al 2 O 3 . (a)Co/Al2O3 (b)70Co30Fe/Al2O3 (c)50Co50Fe/Al2O3, (d)30Co70Fe/Al2O3 (e)Fe/Al2O3. Bimetallic catalysts showed different reduction patterns compared to monometallic catalysts. With the incorporation of iron, for 70Co30Fe/Al2O3, the first reduction peak decreased from 507°C to 447°C while the second peak reduced from 650°C to 501°C and the third peak reduced from 731°C to 667°C. Similarly for the 50Co50Fe/Al2O3 catalyst, reduction peaks decreased from 507°C, 650°C and 731°C to 328°C, 412°C and 614°C, respectively. With further increase in the iron content, for the 30Co70Fe/Al2O3, the reduction temperatures increased again to 456°C, 458°C and 669°C, respectively. The same trend has also been reported in the literature . The degree of reduction (DRT) and the amounts of hydrogen consumed during TPR are given in Table 3. The degree of reduction (DRT), shown in Equation (1), is defined as the ratio of hydrogen consumed for the complete reduction of metal oxides from ambient temperature to 800°C to the amount of hydrogen calculated for this complete reduction . As shown in Table 3, hydrogen consumption for monometallic Co/Al2O3 and Fe/Al2O3 was found to be 652.4 μmol/g.cat and 568.1 μmol/g.cat, respectively. 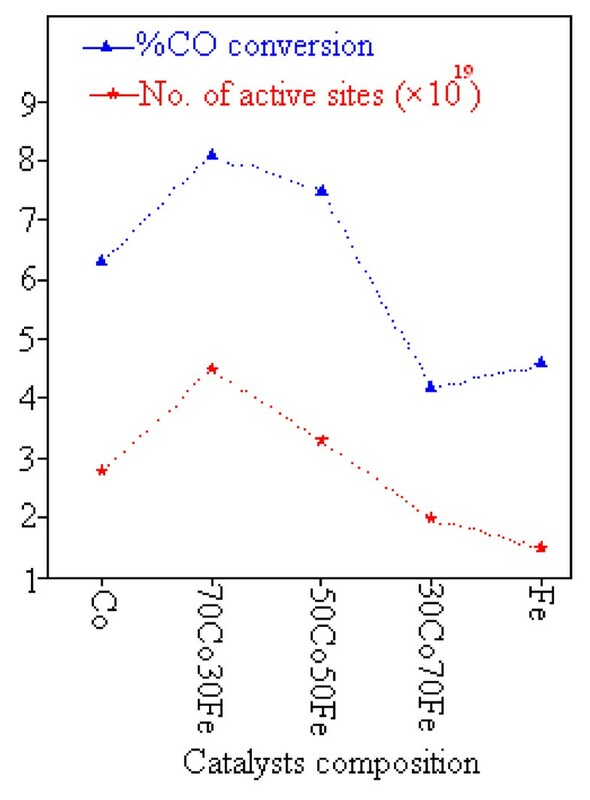 Incorporation of iron into Co catalyst increased the hydrogen consumption, passing through a maximum for 50Co50Fe/Al2O3 and then decreased with increasing iron loading. For monometallic Co/Al2O3 and Fe/Al2O3, the degree of reduction was 58.2% and 52.4%, respectively. With the incorporation of iron into cobalt catalyst, for the 70Co30Fe/Al2O3, the degree of reduction was 70.7%. With further increase in the amount of iron incorporated, a decrease in the degree of reduction was observed where for the 50Co50Fe/Al2O3 and 30Co70Fe/Al2O3 the degree of reduction was 34.6% and 40.1%, respectively. Based on the TPR analysis, it can be concluded that incorporation of 30% of iron into cobalt catalysts enhanced the reducibility, while iron-enriched catalysts displayed an opposite trend. This trend may be due to the fact that incorporation of Fe in higher amounts resulted in the formation of mixed-oxide phases, which were difficult to reduce. The formation of these mixed-oxide phases were confirmed by XRD analysis. TPD and oxygen pulse re-oxidation (assuming Co0 was completely oxidized to Co304) techniques were used to calculate the % dispersion , % reduction  and number of active sites  of the catalysts, using equations (2), (3) and (4), respectively. The results of CO chemisorptions and oxygen pulse re-oxidation for all the samples are summarized in Table 4. It was found that the amount of CO uptake for the Co/Al2O3 catalyst was 2.41 μmol/g, which doubled that of Fe/Al2O3 (1.27 μmol/g). With increasing content of iron incorporated into Co, the CO uptake decreased. For 30Co70Fe/Al2O3, 50Co50Fe/Al2O3, 70Co30Fe/Al2O3, the CO uptake was 1.57 μmol/g, 2.50 μmol/g and 3.77 μmol/g, respectively. As shown in Table 4, for the Co/Al2O3 catalyst the reduction was 13.2% while for monometallic Fe/Al2O3 it was found to be 8%. Incorporation of Fe into Co resulted in an increase in the reduction passing through a maximum for 70Co30Fe/Al2O3. Incorporation of 30% Fe into cobalt catalyst increased the reduction by 53.5% while for the 50Co50Fe/Al2O3 catalyst, the increase in the reduction was found to be 52%. Amongst the bimetallic catalysts, the 50Co50Fe/Al2O3 catalyst exhibited lowest dispersion, which could be due to the formation of mixed-oxide phases which were difficult to reduce. The dispersion of cobalt crystallites in the Co/Al2O3 catalyst was 4.2% while Fe/Al2O3 exhibited a dispersion of 3.7%. The dispersion decreased significantly with iron incorporation, possibly due to the coverage of active sites of Co species by Fe atoms. The dispersion for the bimetallic 30Co70Fe/Al2O3, 50Co50Fe/Al2O3 and 70Co30Fe/Al2O3 catalysts were 3.0%, 2.3% and 3.2% respectively. Incorporation of Fe into the cobalt catalysts resulted in an increase in the number of active sites of the metal. The increase in the number of active sites for the catalysts followed the same trend as that for reduction and dispersion passing through a maximum for the bimetallic 70Co30Fe/Al2O3 catalyst. Incorporation of Fe up to 30% into the cobalt catalyst resulted in an increase in the reduction and consequently the number of active sites increased. The crystal phases of the Al2O3 support and supported monometallic and bimetallic catalysts after calcinations are shown in Figure 4. In the XRD spectrum of alumina support and all catalysts, peaks at 2θ values of 46° and 66° correspond to that of gamma alumina . The monometallic Co/Al2O3 sample displayed the diffraction lines of Co3O4 spinel at 2θ values of 28.5°, 34°, 35.5°, 42°, 53°, 62.5° and 66° [13, 22, 23]. Monometallic Fe/Al2O3 sample exhibited the pattern of hematite at 2θ values of 16°, 28.5°, 35°, 44°, 51°, 56.5° and 61°. For all the bimetallic catalysts, along with characteristic diffraction patterns of Co3O4 and Fe2O3, diffraction patterns of CoFe4O4 also appeared at 2θ values of 16°, 35°, 43°, 53°, 56.5° and 61° [13, 22, 23]. The appearance of diffraction patterns of CoFe4O4 confirmed the formation of complex mixed oxides phases of iron and cobalt. 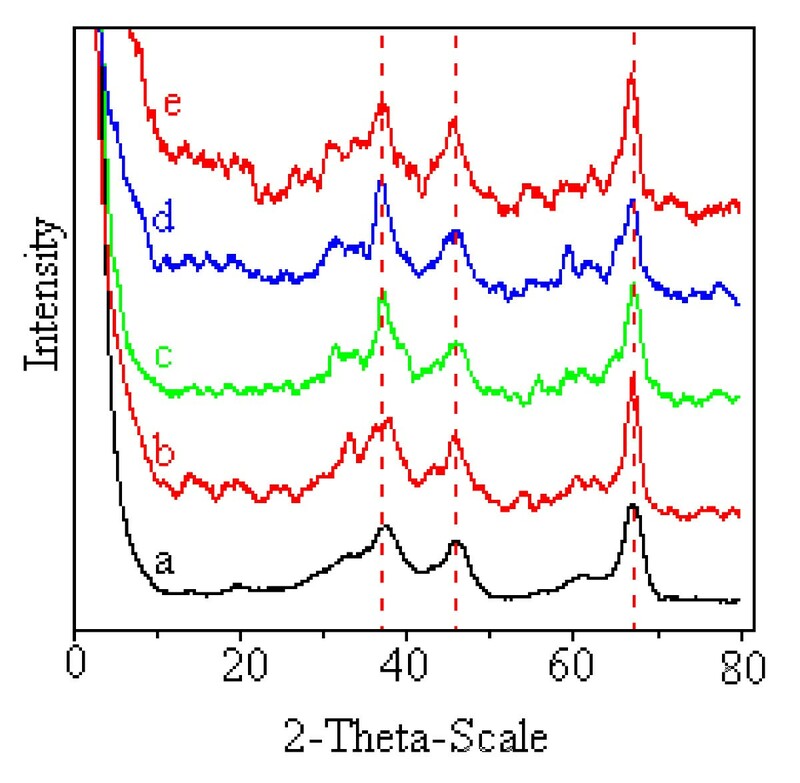 The formation of these mixed-oxide phases may be responsible for the decrease in the reducibility of the 50Co50Fe/Al2O3 bimetallic catalysts, as shown in the TPR profiles. XRD spectra. (a) γ-Al2O3(b) Co/Al2O3(c) 70Co30Fe/Al2O3(d) 50Co50Fe(e) Fe/Al2O3. The catalytic activity and product selectivity data were calculated after 5 hours of time on stream. The CO conversions and product selectivities over the monometallic and bimetallic catalysts are summarized in Table 5. The CO conversion of 6.3% and 4.6% was obtained over Co/Al2O3 and Fe/Al2O3, respectively. The incorporation of Fe into Co resulted in an increase in the CO conversion passing through a maximum for the 70Co30Fe/Al2O3. The values of CO conversion for bimetallic catalysts 70Co30Fe/Al2O3, 50Co50Fe/Al2O3 and 30Co70Fe/Al2O3 were 8.1%, 7.5% and 4.2%, respectively. This trend was in accordance with the results of catalyst characterizations. Incorporation of Fe up to 30% into the Co catalysts led to higher reducibility which in turn resulted in more metal active sites available for Fischer-Tropsch synthesis and thus enhanced catalytic activity. The highest CO conversion was achieved using the 70Co30Fe/Al2O3 which also had the highest CO adsorption capacity. Figure 5 shows variation of CO conversion and number of active sites as a function of catalysts' compositions. Incorporation of iron up to 30% resulted in an increase in the number of metal active sites and hence the increase in CO conversion. Further increase in the amount of iron decreased the number of active sites and hence the CO conversion. FT reaction conditions: P = 1 atm, T = 543 K, H2/CO = 2 v/v, space velocity (SV) = 12 L/g.h. Correlation between the catalysts' compositions and the number of active sites and CO conversions. Using the Co/Al2O3 catalyst, selectivity for methane, light hydrocarbons and C5+ were 15.6%, 80.9% and 3.5%, respectively. A monometallic Fe/Al2O3 catalyst was more selective to methane and lower hydrocarbons than C5+ where selectivities to methane, light hydrocarbons and C5+ were 27.5%, 70.9% and 1.6%, respectively. With the addition of 30% of Fe into cobalt, the CO conversion increased but the product distribution was similar to that of the monometallic Co/Al2O3. However, using the 50Co50Fe/Al2O3 and 30Co70Fe/Al2O3 catalysts, the methane selectivity increased by a factor 15.3% and 19%, respectively whereas the C5+ selectivity decreased by 37.2% and 71.4%, respectively. The C2-C5 hydrocarbon fractions were included in the olefinity calculation. As shown in Table 5, incorporation of Fe into Co changed the olefin to paraffin ratios of the products. Olefinity of the Fe-based catalysts was higher (1.04) than that of Co-based catalyst (0.41). For bimetallics 70Co30Fe/Al2O3, 50Co50Fe/Al2O3 and 30Co70Fe/Al2O3, the increase in olefin to paraffin ratio was 29.2%, 56% and 78%, respectively compared to that of monometallic Co/Al2O3. Alumina-supported monometallic Co and Fe and a series of Fe/Co bimetallic catalysts were studied. 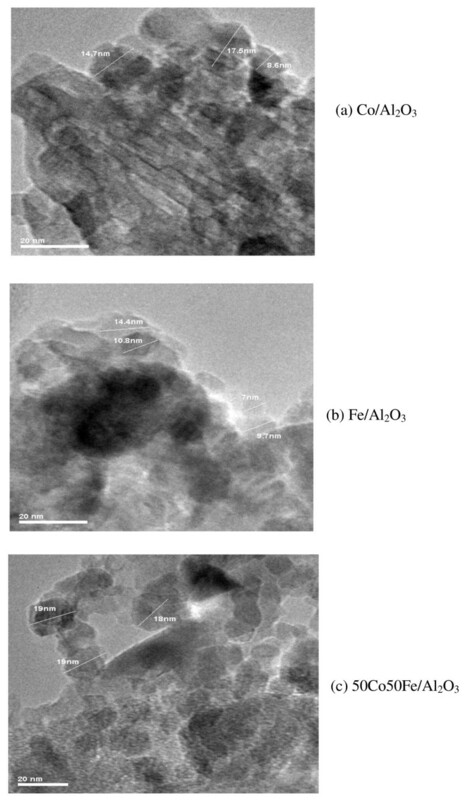 The Fe/Co bimetallic exhibited different physicochemical properties than the monometallic Co and Fe catalysts. Various characterization techniques revealed that addition of Fe up to 30% resulted in an enhanced reducibility and increase in the CO and hydrogen chemisorptions which resulted in an increase in the number of active sites and consequently increased the CO conversion by 28%. However hydrocarbons selectivities did not change significantly. Further increase in Fe resulted in increasing trend in CH4 selectivity and decreasing C5+ selectivity which could be due to the formation of bimetallic mixed oxides phases, enriched with Fe. All the monometallic and bimetallic nanocatalysts were prepared using the wet impregnation method with 5wt% metal loading. These catalysts were assigned as 5wt%(X%:Y%)/Alumina (where X% and Y% represent percentage of Co and Fe, respectively). Before impregnation, alumina (Merck, BET 190 m2/g) was calcined at 500°C for 6 hours. For each catalyst, required amounts of the precursor salts i.e. Co (NO3)2.6H2O (≥ 98%, Fluka) and Fe(NO3)3.9H2O (≥ 99.0%, Merck) were dissolved in deionized water and added to the support drop-wise with constant stirring followed by drying in an oven at 120°C overnight and calcining at 500°C in nitrogen atmosphere for 6 hours. The reduction behavior of the catalysts was studied using TPDRO1100 MS (CE instrument) equipped with a thermal conductivity detector and a mass spectrometer. The catalyst sample (0.5 g) was placed in a U-shaped quartz tube and degassed in a flow of nitrogen at 200°C to remove traces of water. Temperature-programmed reduction (TPR) was performed using 5% H2/N2 with a flow rate of 20 cm3min-1 and heating from 40°C to 900°C at 10°C min-1. For CO and H2 chemisorptions, 25 mg of the calcined catalyst was reduced under hydrogen flow at 400°C for 5 h and then cooled to 50°C. Then the flow of hydrogen was switched to nitrogen. Temperature-programmed desorption (TPD) of the sample was performed by increasing the temperature of the sample to 400°C at 10°C min-1 under argon flow. The TPD spectra were used to calculate the metal dispersion. After the H2-TPD, sample was re-oxidized by pulses of 10% Oxygen in helium (TPO). The resultant TPO spectra were used to determine the % reduction. The CO chemisorption was performed by introducing pulses of pure CO at 250°C after the H2-TPD. 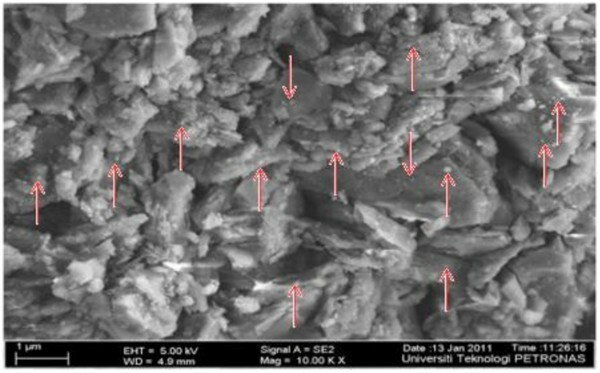 Morphology of the catalyst sample was characterized using transmission electron microscopy (Zeiss LIBRA 200 TEM) at 200 kV accelerating voltage. The surface area, pore volume and average pore size distribution of the catalyst samples were measured using N2-adsorption (Micromeritics, ASAP 2020). Crystallinity of the samples were measured by powder X-ray diffraction (XRD), using a Bruker D8 Advance horizontal X-ray diffractometer equipped with a Cu anode. Fischer-Tropsch reaction was performed in a fixed bed microreactor at 543 K and 1 atm with H2/CO = 2 v/v and space velocity, SV = 12 L/g.h. Typically 0.03 gm of calcined catalyst sample was reduced in situ at 653 K for 5 h in 30 ml min-1 of pure hydrogen. On-line gas analysis was performed during the FTS reaction using Agilent 6890 Hewlett Packard (HP) gas chromatograph (GC) equipped with TCD and FID detectors. The CO conversion, hydrocarbon (HC) selectivity and olefinity were calculated using equation (5), (6) and (7), respectively. The authors acknowledged financial support provided by Ministry of Science, Technology and Innovation (E-Science Fund No: 03-02-02-SF0036), FRGS grant (project No: (FRGS/2/2010/SG/UTP/02/3) and Short Term Internal Fund Universiti Teknologi PETRONAS (Project No.31/09.10). SA performed the experiments and drafted the manuscript. DS assisted in the Fischer-Tropsch reaction study. NAMZ participated in the conception, design of study and revision of the manuscript. All authors read and approved the final manuscript.